In nearly all car suspension modification you’re not starting with a blank sheet. Instead, you have what the car’s manufacturer provided – whether that’s a McPherson struts, wishbones or some other design. Mods might then involve altering spring rate and length, or changing bushes or dampers. But what if you are starting from scratch – whether that’s in the design of a small vehicle like a fun go-kart, or in something more serious like a track-only or kit car? In those cases you have complete freedom of choice in the design... and then where do you start? In this article we’ll take a look at the advantages and disadvantages of different suspension designs. 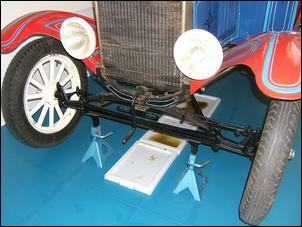 The simplest front suspension is a beam axle. In this design a solid piece of metal (the beam, often forged in an H-section) connects the two wheels. The wheels are mounted on vertical (or near vertical) swivels called kingpins, allowing the wheels to be steered. The axle is most often suspended by a pair of leaf springs, arranged fore-aft as close to the outermost ends of the axle as possible. 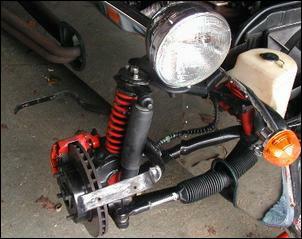 Alternatively, a beam axle can be suspended by coil springs (or a transverse leaf spring) and locating links. Front beam axles are still used on trucks and off-road style four wheel drives but their use on cars starting declining in the 1930s. The advantages of the beam axle include strength, simplicity (and therefore low cost), and the fact that each wheel remains vertical at all times - that is, there is no camber change with suspension deflection. However, the disadvantages far outweigh the positives. The disadvantages include a heavy unsprung weight resulting in poor ride and tyre adhesion over bumps, and the fact that the behaviour of one wheel can affect the other. When they are steered, the wheels can shimmy and tramp, and obviously a bump experienced by one wheel is directly transmitted to the other. Finally, if there is to be sufficient suspension travel, a beam axle takes up a lot of room. For these reasons, a non-independent beam axle design is seldom used on any vehicle – even a fun dirt kart. Before we look at the different designs of front suspension, a word on the two most vital of characteristics of independent suspensions – roll centre and end-view swing arm length. The roll centre is an imaginary point about which the car rolls. 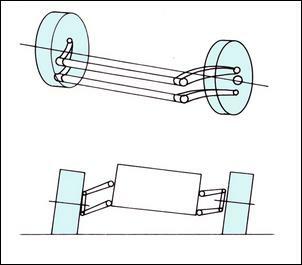 The calculation process that’s followed to find the roll centre varies a little according to the suspension design; this diagram shows the approach for double wishbones where one wishbone is angled to the horizontal. The lines of the wishbones are extended until they reach a common point – ‘A’. A line is then drawn that connects ‘A’ to the centre of the tyre’s contact patch – ‘C’. The roll centre is where this line crosses the centreline of the car – ‘R’. Because the roll centre is governed by the geometry of the design of the suspension system, it is different in position (and often height) for the front and rear suspensions. The roll centre position also often changes with suspension movement. The amount of body roll that occurs with a given cornering force largely depends on the relationship between the height of the centre of gravity and the roll centre. Raising the suspension roll centre, or lowering the centre of gravity, will decrease roll. However, while having a high roll centre therefore sounds attractive, it has significant negatives associated with it. In fact, most well set up cars run a roll centre at, slightly above, or slightly below ground level. 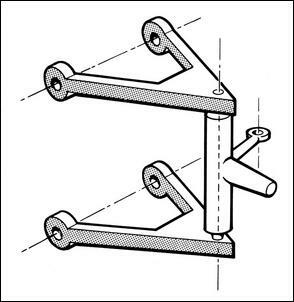 The end-view swing arm length indicates the lateral distance between the wheel and the virtual pivot point (‘A’ in the above diagram). The shorter the swing arm length, the greater the change in track during suspension movement and the greater the camber gained during bump. This camber gain is normally desirable (see the Dynamic Camber Gain breakout) but if the swing arm is too short, the system starts to act like a swing axle, with resultant jacking forces. A swing-arm length of 2.5 – 3.8 metres is a good compromise. A sliding pillar (or sliding kingpin) design looks much the same as a beam front axle but the wheel is allowed some vertical movement on its steering swivels. 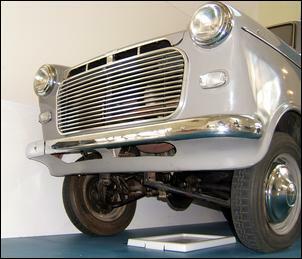 This system is characterised by very limited suspension travel and stiction, resulting in a poor ride over small bumps. Very few cars have ever been made with sliding pillar suspension. 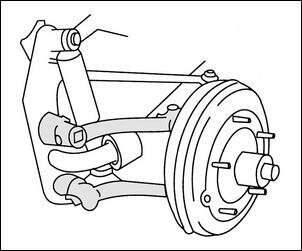 A swing axle effectively divides a beam axle into two, placing a pivot on the inner end of each half of the axle. The wheels can therefore more independently of each other which improves ride, tyre adhesion and prevents the action of one wheel immediately impacting on the other. 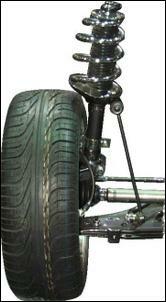 However, a swing axle is about the worse of the independent suspension designs. The major disadvantages of swing axles are that when cornering, the car is lifted via a so-called jacking effect. This jacking causes positive camber on the outside (ie loaded) wheel. The result is a sudden loss in traction. Benefits of the swing axle include the fact that the system is independent and the approach is simple and so cheap. Swing axles have a high roll centre and a swing arm length which is short – in fact, as long as the swing axle itself. Swing axles have been used on a number of car designs, although usually on the rear rather than the front. The pictured Lightburn Zeta is one of the few cars that has run a front swing-axle design. Early Volkswagen Beetles and the Corvair used swing-axle rears. 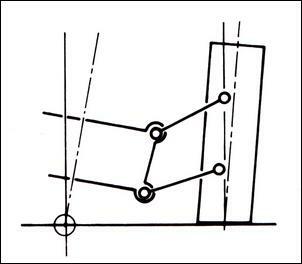 As the name suggests, a trailing link design uses two longitudinal links to support the steering ball joints. The wheels are pulled over bumps – the links are in tension when the wheel encounters a resistance. Early Volkswagen Beetles use trailing link front suspensions. Advantages of trailing link designs are that the system is compact (especially if torsion bar springs are used) and can provide a good ride. However, when subjected to lateral cornering forces, the arms tend to bend so must be made strong to resist these forces. The camber of the tyres also changes as the vehicle rolls in cornering, reducing adhesion. Finally, there must be plenty of strong chassis or bodywork directly ahead of the front wheels to carry the mounting points of the trailing links. Trailing link suspensions have an infinitely long swing arm length and a roll centre at ground level. 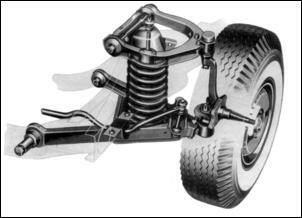 While now very long in the tooth, Volkswagen trailing link front suspension can still be found being used in some kit cars and specials, primarily because of the huge number of Beetles that were produced with this design and the way in which the Beetle chassis can be adapted to other bodies. This design is one of the most common used today on cars. In this approach the damper and spring are usually integrated into a near-vertical assembly with a ball joint placed at the base of the strut and another bearing placed at its top. The whole damper/spring assembly turns with the steering, with the wheel mounted on a stub axle that’s connected to the base of the strut. The upper end of the strut bolts straight to bodywork and the lower part of the strut is located by (usually) an anti-sway bar and a link. Advantages of the design include a long swing-arm length and a roll centre that can be at ground level. The wide-spaced mounting points also make the design very strong. However, the presence of the spring/damper and steering knuckle in close proximity to the wheel leaves little room for large tyres without the tyre being well outboard of the point at which the steering axis would touch the road. This results in an increased scrub radius, resulting in more unwanted feedback through the steering wheel and potentially more nervous behaviour under brakes and over variable road surfaces. However, the most significant negative is that the system cannot be set up to provide much increased camber on compression, resulting in a camber loss in cornering. In this design wishbones – or A arms – are used top and bottom to support an upright to which the wheel is attached. The broad lower base of the arms connect to the frame while the ball-joints are mounted on the apex of the arms. When the arms are of equal length and mounted parallel to each other and to the road, the swing-arm is infinitely long and the roll centre is at ground level. That combination of factors sounds very good, but the disadvantage of such an approach is that there is no camber gain when the body rolls in cornering – in fact, as shown here, the tyres can go into positive camber. Advantages include strength (the arms are in compression when lateral cornering loads are applied and the wide base of the arms spreads the loads) giving better dynamic location of the wheel on rough roads and when cornering, and good ride. If equal length double wishbones are altered so that the upper wishbone is shorter, the advantages of an equal length wishbone system are retained but in addition, camber gain can be created during bump – and so camber of the outer (loaded) tyre during cornering. 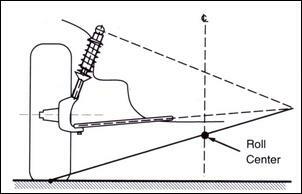 Furthermore, by changing the angles and lengths of the arms, it is possible to change the amount of camber gain during deflection, and also alter the roll centre position and swing-arm length. Disadvantages include complex construction, a large number of bushes and/or ball-joints, and critical geometry of the mounting points. Car tyres work best when they are vertical to the road ie have zero camber. If the suspension maintains a constant camber in compression, when the car rolls (ie the outside suspension is compressed and the inner extended), there will be an effective camber loss of the more heavily loaded outside wheel during hard cornering. For example, if the static camber is zero and the car rolls by 3 degrees, there will be a positive camber gain of 3 degrees of the outside wheel. It’s for this reason that the static camber is normally set negative (ie the wheels lean in at their tops), resulting in a vertical tyre when in full roll. However, using lots of static negative camber can cause straight-line tyre wear and instability under brakes. A better way is to use a suspension design that adds negative camber in bump. An unequal length double wishbone suspension will cause the wheel to increase in camber (ie have a negative camber gain) when the suspension is compressed. This dynamic camber gain can be used to effectively offset most or all of the camber loss caused by body roll. 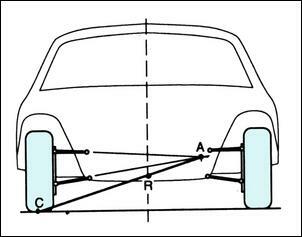 For example, a suspension may be designed to add 1 degree of negative camber for every inch of bump.